A "potcake" is the Bahamian term for the thick, congealed food that remains in the bottom of a pot of peas and rice after several reheatings. Traditionally, Bahamians feed potcake to the outdoor, indigenous dogs that freely populate the Bahamas. 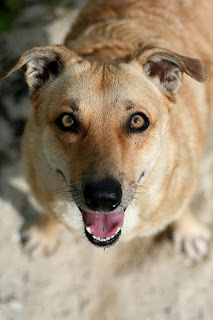 Hence the dogs have come to be known as Potcakes, with a capital P.
Although officially considered mixed breed dogs, Potcakes are recognized as a breeded dog in The Bahamas. They have distinct characteristics that include everything from size and coat to temperament and genetically-imprinted behavior patterns. This is because, until very recently, all island dogs shared the same isolated gene pool. If for no other reason – and there are many, many other reasons as well – this makes the Potcake an extremely unique species of canine. Depending on what genes are available on any Bahamian island, Potcakes strongly resemble each other. Some island's Potcakes look more like the typical "pariah dog" found in locales such as India and North Africa. Elsewhere, their lines hint at hound, mastiff, spaniel, terrier or retriever ancestors.